Donate For A Permanent Building for Orphaned Children. 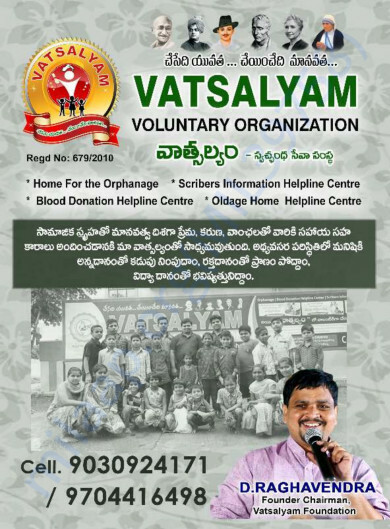 VATSALYAM VOLUNTARY ORGANISATION is a philanthropic 'not for profit' NGO which is serving the cause of ORPHAN and SEMI-ORPHANED CHILDREN WITH FOOD, SHELTER, EDUCATION and other training programs for the past twelve years. It's a registered society with exemption under Income Tax Act. While more than hundred children have been served, presently around 40 children are beneficiaries of this Orphanage at Plot no. 30, Vijaya Gardens, Near Balwant Reddy Gardens Function Hall, Bandlaguda Road, Nagole, Hyderabad 500 068. Till now, the Orphanage was run in rented premises and the children are educated in nearby schools and colleges with the great support of philanthropists and managements of schools who are offering education at concessional fees structures. NOW THE PRESENT LANDLORD INTENDS TO SELL OFF THE PROPERTY AND HAS ORDERED TO VACATE BUILDING WITH IN TWO MONTHS (60DAYS). Considering the fact that Vatsalyam is not able to find suitable alternate accommodation in that area (It has been Vatsalyam's experience that there is lot of resistance from building owners to rent their properties to Orphanage) and shifting of the Orphanage to other areas will severely impact the education of the 40 children (in the form of finding admissions for them in other schools), Vatsalyam is seriously Searching For Permanent Shelter Near By The Schools to buy the property for Rs. 95 lacs (240 sq. yard). THIS IS A SINCERE APPEAL TO CONTRIBUTE TO THE NOBLE CAUSE OF PROVIDING A PERMANENT SHELTER FOR ORPHANAGE. EVERY RUPEE FROM YOU WILL BE VALUED AND CHERISHED BY THE CHILDREN. PLEASE CIRCULATE THIS MESSAGE AMONG YOUR FRIENDS, RELATIVES AND ACQUAINTANCES. Mr. Raghavendra, the founder chairman of Vatsalyam will be too glad to receive you, if you would like to see the Orphanage before you decide to contribute. With the help of your contributions, the construction of the shelter has begun. The funds were utilized in buying the raw materials. Currently we have a group of 40 kids who will be staying here. We thank you for the love and support which you have shown towards us, please keep sharing this campaign among your family and friends.